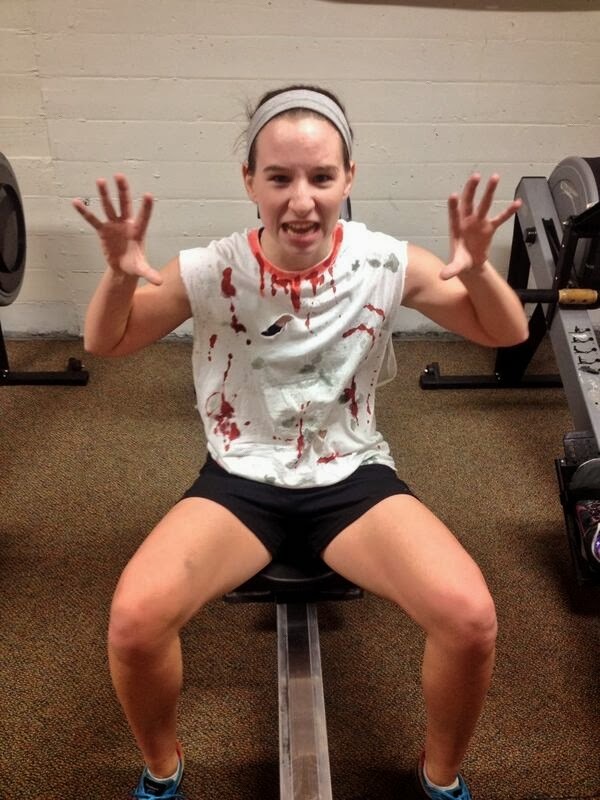 Via Twitter (@RacerRowing): Jordan Robbins was attacked by an erg! Several weeks ago, Racer Rowing celebrated Valentine’s Day with an annual 5k “massacre” erg test. According to club president Matt Fisher, this year’s return to the February tradition demonstrated the club’s sincerity of purpose as members sought to improve race times following their loss of the Team Trophy at the Tennessee Indoor Rowing Championship. Fisher writes, “Looking at the numbers…the workouts we have been doing have drastically improved our times.” Indeed, several members of the team set personal records last month! Racer Rowing has spent its winter months completing regular ergometer workouts simulating up to 14 kilometers per day followed by sprint pieces and weight training. Fisher credits coach Marshall for providing the much-needed direction and encouragement that the team needs during this especially challenging period of the training season. Additionally, the team has devoted regular time to developing technique and team unity (Funday Friday). Besides celebrating Valentine’s Day with a 5k erg test (to most of us Alumni, this sounds like the exact opposite of celebration, doesn’t it? ), Racer Rowing hosted its first ever Date Auction. During this first event of its kind for Racer Rowing, dates with about 30 team members were sold to the highest bidder generating about $550 for the team. Do you have a Racer Rowing story to tell? Do you have photos of the team in action? Please share your words and images with the Racer Rowing Society. Contact the site’s moderators to get content posted. Funday Friday? I wonder what shenanigans get counted as fun these days? When we took a break from the ergs during the Epoch 1 years, we played ultimate Frisbee and sometimes soccer. We also sometimes played basketball. Seems like a poor idea in retrospect...Somehow I can always remember somebody getting injured (most often me). I found erging to be an activity that cultivated a quiet dignity. To the opposition of most of my friends, I preferred the winter workouts on rowing machines to our adventures in cross-training. Running stairs is a funday. Dan--Running stairs got you in trouble once. Just sayin'! Stick with an inclined treadmill.